Every once in a while I come across a home with no gutters. The point of a gutter and leader (downspout) systems is to collect rainwater from the roof and direct it away from the building foundation by means of leader extensions, splash blocks, or underground drain lines. 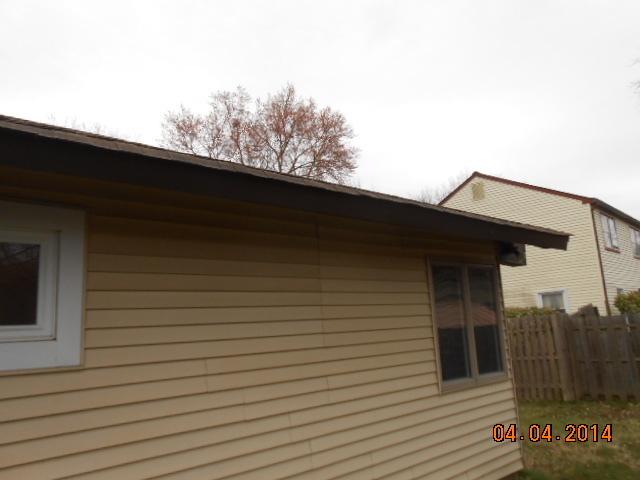 An improperly functioning gutter and leader system can add to water and ice backing up against fascias and under roof shingles, can damage soffits, and can discolor or deteriorate siding materials. Faulty gutters and leaders can also lead to soil erosion adjacent to buildings and serious water and foundation displacement problems in basements and crawl spaces. Gutter systems take more abuse from extreme weather conditions, particularly ice and snow, than any other component of the building envelope. They are also subject to damage from ladders and being stepped on, as well as from falling tree limbs and debris. Deteriorated bricks make this buyer nervous! This section of brick separated because of an above leak that entered behind the brick veneer. 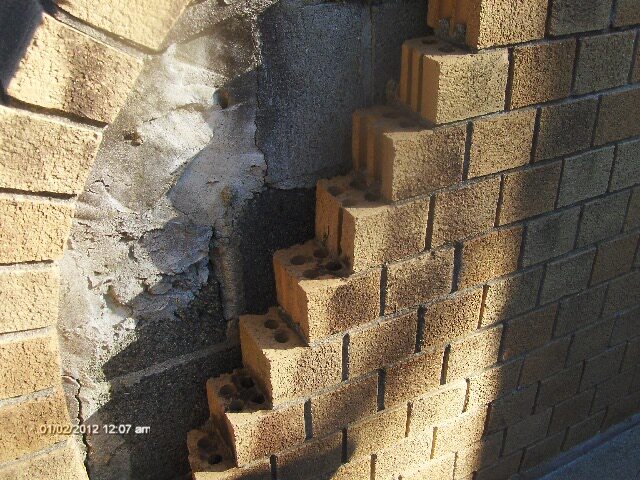 The damage accumulated over this past winter when the freeze / thaw effect pushes the brick away from its underlayment. Freezing water expands and breaks the seal that holds the brick to the mortar. It is only a matter of time before the damage is noticeable and repairs are needed. This kind of damage can scare a buyer away. If there is above damage to the soffits and roof due to breaks in the flashing then the repairs can be even more extensive. As home inspectors in NJ we have a duty to make sure the buyer knows to call in contractors for estimates prior to closing. That way they know exactly what to expect after they move in. If you see a gas fired furnace or boiler in the basement of home that you are interested in purchasing after a home inspector goes through and discovers evidence of an underground oil tank during the home inspection you will need to take some precautions. Evidence of an existing or pre existing tank can include copper lines transitioning a foundation wall. Exterior fill pipes exiting the ground. Often though the tank was in the basement and removed. 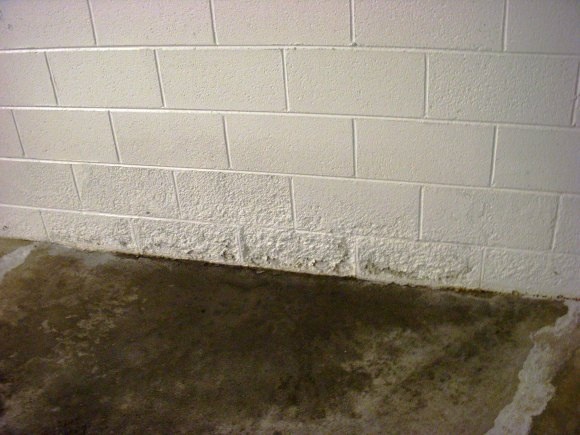 The tanks placement can often be found by marks on the concrete floor where the oil lines ran along the floor or the feet of the tank leaving marks in the concrete. Circumstances can vary upon the discovery of a tank. Some tanks are removed others are filled with sand under the ground. Active oil tanks under ground can often pose problems. Leaching oil from cracked tanks can cause many problems. Large remediation expenditures are not uncommon. I remember a situation about 25 years ago when a leaking oil line cost over $500,000. to remediate only to eventually result in the demolition of the home. Today oil tanks are not installed underground. Some older towns like Aberdeen and Middletown will have tanks underground that were installed in the 50′s, 60′s and 70′s. I have been told by some remediation companies that all tanks leak. It is a matter of degrees. If your home inspector finds evidence of an oil tank you can get the soil scanned by a tank service company. This will let you know if there is a tank anywhere on the property. As we leave this harsh winter and enter into spring, now is a great time to go outside and evaluate your grading. Water problems usually become more apparent in summer from heavy rains or after rapid snowmelt during the winter/spring months. 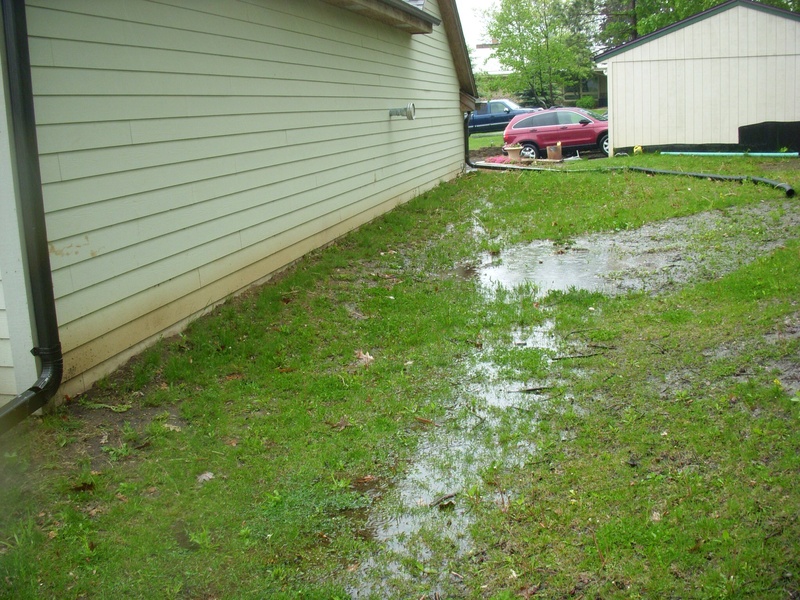 Common issues from poor grading usually lead to; cracked walks due to heaving/settlement, water seepage into the basement or lower levels, standing water, rot to exterior siding, and a continuously running sump pump to name a few. Today on my home inspection in Barnegat New Jersey I discovered a negatively pitched grade, causing water seepage into the basement and garage levels. I explained to my client a few recommendations for remediation to reduce or eliminate these issues. Simple maintenance is the key to maintaining a positive grading. It’s recommended for slope of 1 inch per foot, for a minimum of 5 feet, away from your foundation as a guide to creating a positive in grade. 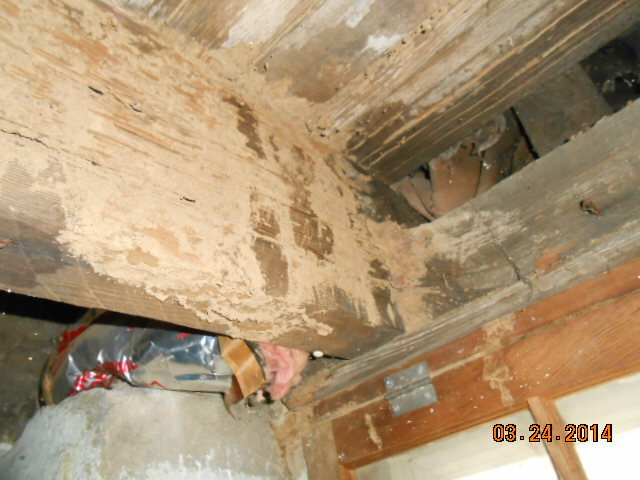 On a recent inspection in Moorestown, NJ I found major termite damage to the joists and sill plates. This damage extended past the sill plate, box beam and wood flooring. This damage pictured above is going to cost almost $1,500.00 to repair. Most times the homeowners will have to repair the damage in order to sell the home. Sometimes when inspecting a vacant home in the winter time the utilities are on. Sometimes the heat is off. That was the case here. 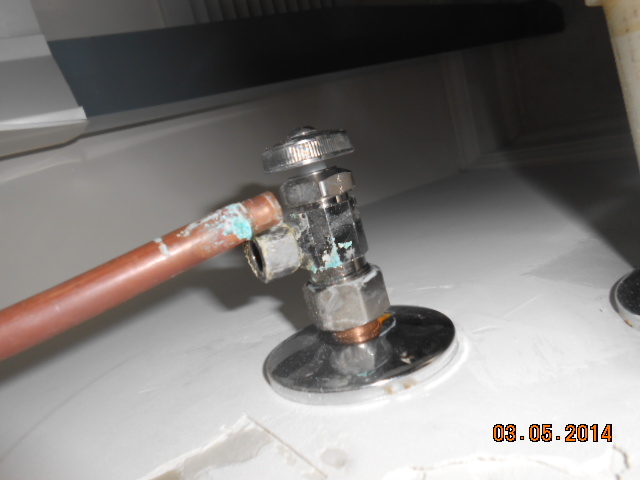 With the heat off this Brick home had a copper pipe burst just under the slop sink. The gushing water flooded the empty home. When inspecting such disasters it is important to bring moisture meters, pliers, flashlights and screwdrivers. My job as the home inspector was to find the burst pipe. The buyer thought is was the in wall supply to the washer. It was not the pipe came right out of its sleeve. The home was mitigated for mold and all the flooring replaced on the first floor. That cost a lot more than running the heat for a few months. As home inspectors we know that moisture coming up from a dirt crawl space into the sub floor of an average home can carry with it gallons of moisture. Moisture that will be deposited on the sills, joists, main beams and sub floor. On a recent inspection in Hamilton NJ I saw a vapor barrier that was a bit unusual. It did not stop at the crawls edge. It went up the side of the foundation and was attached to the sill plate. This barrier will keep moisture from building on the sub floor expressed as mold, rot, white rot and cubicle rot. If the conditions are not reversed the damage can mount to the thousands. This is a picture of a vapor barrier the way it should be installed. As home inspectors in NJ we see asbestos tiles on inspections in older homes. They were popular in the 40′s, 50′s and 60′s. These tiles are considered safe when they are not damaged. Asbestos must be inhaled or injested in order to pose a health risk. If we find asbestos tiles on an inspection we will recommend the tiles be either removed or more preferably covered. Created in the 1920′s as a replacement for highly flammable wood siding, Asbestos / Cement type siding was used on 100′s of thousands of houses across the US by the 1940′s. New Jersey included. By the early 1970′s, the reported health hazards grew and the government took action by banning their use in 1973. These shingles are mainly cement with asbestos fibers used for reinforcement. If installed properly and not damaged, they’re acceptable. 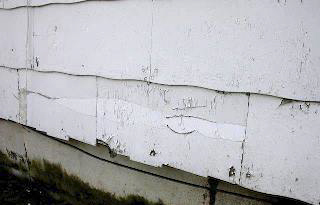 If the siding becomes damaged, cracked or gets to a “crumbling” stage, such as the photo above, health concerns rise as the dust can become airborne and inhaled. Still on houses today, I inspect a percentage of houses in NJ with Asbestos / Cement siding, some of which are a concern but not always. If the siding is properly installed, in good shape and maintained, it should be OK. If renovations or additions are done to a house with this type of siding, consult experienced, trained contractors. Similar looking products made without asbestos are available to replace damaged shingles. Exterior siding is part of a Home Inspection. Our Home Inspectors know the health concerns associated with this siding if damaged and will report on any potential hazards. admin on Carpenter Ants found on my home inspection. Is that serious?